Merry Christmas! I do hope that you were surrounded by loved ones and counted your blessings. Before I tell you my Crafty Resolutions I wanted to share some photos of my wonderful niece's baby shower invites and a few decorations. Oh what a joy it was piecing together over 60 of these! My sister and I worked on them ALL day and we are very pleased with how they turned out. Sisters idea to knot the twine and put it at the top to look like a vine. we used stock stickers for the inside monkey due to time constraints. 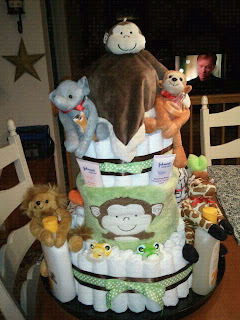 This is the back of the Diaper Cake my sister made. She did an outstanding job - I'm so proud of her! The front of the awesome cake. My sister is very much like Martha Stuart in the sense that she can sew anything, decorate like you would not believe (her home is like a showcase) and she is probably the best cook I know. She is not crafty in this sense - she claims I got those genes but she proves herself wrong with this diaper cake. I wish I would have taken more photos of the house and how she had animals hanging from here and there - the cookies she made that looked like monkeys and the beautiful array of food and deserts! I wasn't sure what animals I would use on the banner, so I cut out tons of them - cause you never know. You'll be able to see in another photo how they are all throughout the living room where the shower was held. I really like how this banner turned out. Jaxon is due to arrive January 28th or so and will be Lauren & Ray's first baby. Laurens bestie made this cute Monkey in a tree and framed it. Everyone at the shower put their thumbprints in various shades of green on the tree and it now hangs in the Nursery. What a fantastic idea! This toy box was made by one of Lauren's friends - hand drawn and painted - beautiful! Ok - now that is out of the way let's talk Resolutions. I normally don't do Resolutions cause lets face it, they are hard to stick to. But I don't think I'm going to make any I can't stick to so here we go! 2. I will make at least 3 items per week in my craft room. I must take the time to use my supplies and make pretty things. 3. I will post at least 1 time per week, complete with photos and or video. No more babbling posts about nothing with empty promises of "I'll try to post soon"
4. I will TRY, yes TRY to start my scrapbooks (I only have 15 brand new still sealed Westin books from 40 years ago that need filled) but only after I see that #'s 1, 2 and 3 are being done! So, if you read this far I'd like to reward you by announcing some blog candy. I will give the winner a cartridge, a cuddlebug folder set and a few surprises. The more comments I get, the more things I'll throw in the box of Blog Candy - To qualify for the blog candy, please leave a comment and tell if you have resolutions. Tell me if you think I can stick to mine and if you aren't already a follower, please become one. Fabulous party decor!! I love all the monkeys:). I think you'll totally be able to keep your resolutions - you can do it! 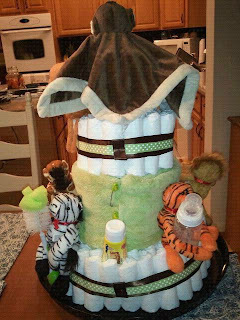 That is a fabulous diaper cake! The banner turned out beatifully made! Congrats to your sister! Everything you made is fabulous. My resolution is to do more scrapbooking of the piles of pictures I have. As to you sticking to your resolution, I hope you can be stronger than me. I yet to keep one....LOL. Congrats to you and your sister. First of all I love the invitations Android decor for the party. Absolutely ADORABLE! That little boy is one lucky little guy Android he hasn't even made his grand entrance yet! Finally I love your resolutions! They are totally doable Android I have no doubt you will do them. I remember howhard you worked on your resolution to use every cart you own. You did very well on that one if I recall correctly. These will be a piece of cake! I think I may have to steal these resolutions too! Hi Tangee! I just love all those baby shower creations. Love the invites, the diaper cake is awesome! I hope you will stick to your resolutions, at least starting from number 2, because not buying stuff anymore-it can be really hard. My resolution is to make more crafty things for my daughters, they sometimes ask for something like decorated notebooks or just large images to put on the wall and I rarely agree, I really want to make more of those. And like you I want to catch up on scrapbooking, this was the reason why I started scrapping when my twins were born, they are 4.5 yrs old now and i need to keep on making scrapbook LOs. Thanks for a chance to win some goodies. I love your pictures and did a very good job on the stuff you made for the shower. I have been a follower of yours for a very long time. My resolutions is to get more of my albums done and keep up with the Birthday Cards that I need to make for the ladies in our Ward (Church). Yes I think you'll keep your goals going and if nothing happens in your life to knock you off your goal you will make it. Love your projects, they are adorable. 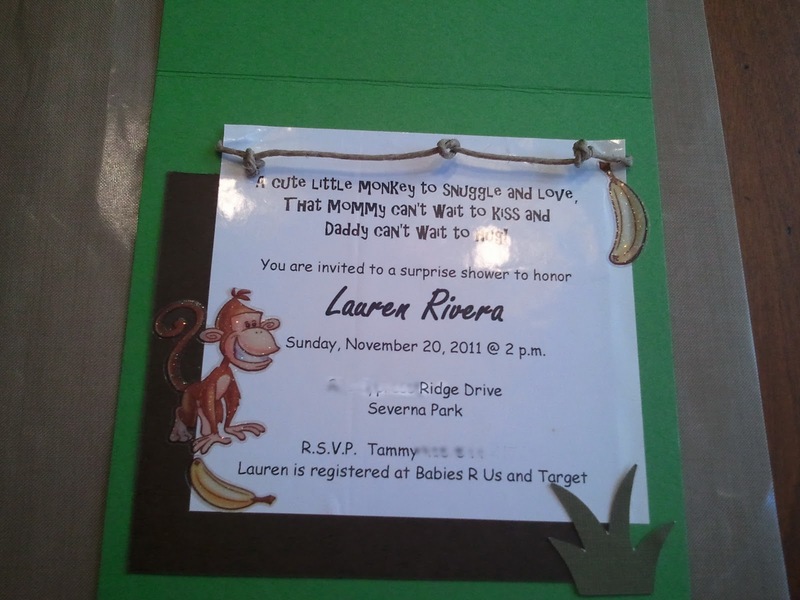 the invites, diaper cake and banner are just perfect. I might have to scraplift these for my sister-in-laws baby shower. As far as new year's resolutions, I don't ever make any, I don't like the feeling of added pressure on top of everything I'm already committed too. I personally have had such a difficult year this year which started off with surgery in January, an unexpected long hospitalization and death of a family member and now a foot injury which has landed me in a boot. I am just looking forward to the beginning of a new year and to good health. Wishing you and your family the same! What darling projects! As far as new year resolutions for myself....I don't usually make any. I started working on losing weight last May and I plan on continuing my weight loss plan. I also want to work on padding the savings & a some money aside for my daughter for college. It is sneaking up fast! I think anyone who truly wants to make a change and makes a resolution, can stick to it with hard work and determination! I am sure you can do it if you set your mind to it! Thanks for the chance to win. I have become a follower and also now follow via network blogs on Facebook! Amazingly adorable decor for the baby shower! As for the resolutions #1 would be difficult for me but I plan on starting to organize my craft room and to put my new cricut to good use! I love all the baby shower stuff. My resolution is to get my craft space organized and to finish my daughters scrapbook for her graduation. I believe you can stick to your resolution. I love that cake how fun!! and the thumb print tree idea! amazing! 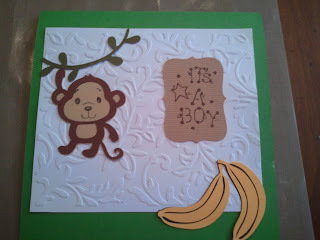 I love all the monkey baby shower items. I do have several goals for next year,1. To used my supplies I currently have on hand, complete 100 layouts and 100 cards, tryout for more design teams, take some classes at a scrapbook store and blog more. I do think you can stick to your resolutions, but im not sure about me sticking to all of mine. Countrygirlin_md at yahoo dot com. Lovely shower decor! Looks like it was a lot of fun! My resolutions? Well, they are very similar to yours with 20 min of exercise 3-4 times a week thrown in. Big thing is making time to make stuff to use up my stash. I do think you can follow through with your resolutions and I have my fingers crossed that I can follow through with mine too!!! Hiya Tangee! Happy New Year to ya!! Hope 2012 brings you loads of good health and happiness! I think that you'll prob. be able to stick to all of your reso's, w/ the exception of one:- that last one (the scrapbooks) My clue was that you've had them for 40 yrs.?! Why start now? LOL Just kiddin'. :-) But that sure is a task at hand! I hope you have a wonderfully crafty New Year !! Tangee, to quote Yoda, "There is No try. There is only do." So WILL you get those scrapbooks done? If I say I doubt it, will it inspire you to prove me wrong? Hmmm...? As for me, no, I make no resolutions because I can't keep any. My life is dynamic ... I never know what flies in over the transom. It's what makes life interesting. Would I/could I have it any other way? Sure. But it's not ... so why fret? Thank you for the oppty to win yummy candy. I love surprises that the mailman brings. And NO, bills do not count as happy surprises!!! !